We believe in the pursuit of a better tomorrow. Our programs include personal training, strength training, cardio, group classes and much more. Over the past 32 years, we have continually improved and expanded our programs to best meet all our members' needs. Enjoy a little break, workout and know that your child(ren) are safe while you take time to rejuvenate. Our Kids Club staff is very carefully chosen ensuring your child will have a wonderful experience each and every time. The Princeton Club started as a small health club on the east side of Madison. Founded by a local Madisonian, Dave Gerry had a simple goal: offer Madison, WI a premier health club that combined state of the art equipment and a highly trained fitness staff with convenience as a top priority. His commitment to excellence, combined with a desire to constantly offer the members the best the fitness industry has to offer, has resulted in the Princeton Clubs becoming the largest, most respected health clubs in Madison. Princeton Club is honored to have been named “Best in Madison and Dane County”. Because we understand that your days are busy, we make our health clubs as convenient and accessible as possible. This starts by keeping the clubs open 24 hours a day, 7 days a week. Secondly, our members have full access to all of our premier clubs. You’ll never be more than 10 minutes from your next workout! This goal of offering quality and convenience is carried over into the structure of our memberships. Become a member and all classes (spinning, box aerobics, pilates, bosu, water aerobics) are included and no class requires a commitment. Just join in when you can. 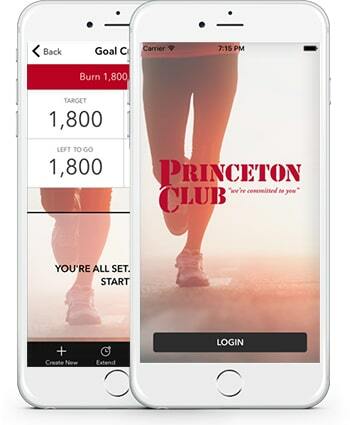 The Princeton Club App provides class schedules, social media engagement, creation of goals and participation in club challenges. Our app will also allow you to link many of the popular fitness tracking devices and fitness apps on the market. Over the past 29 years, we have constantly improved and expanded to best meet our members’ needs. Growing from a single small health club to 3 multi-million dollar, state-of-the-art facilities has been fun, and we would like you to join us as some of the most exciting changes are still to come. Our members also enjoy completely free childcare. No need to make an appointment. Just check your children in and our friendly playroom staff will care for your child while you exercise. Looking for a great opportunity? We are always searching for a great new talent. Contact Princeton Club of Madison to find our more about our current openings.